Update: Still available for $13.99 Prime shipped but currently backordered. 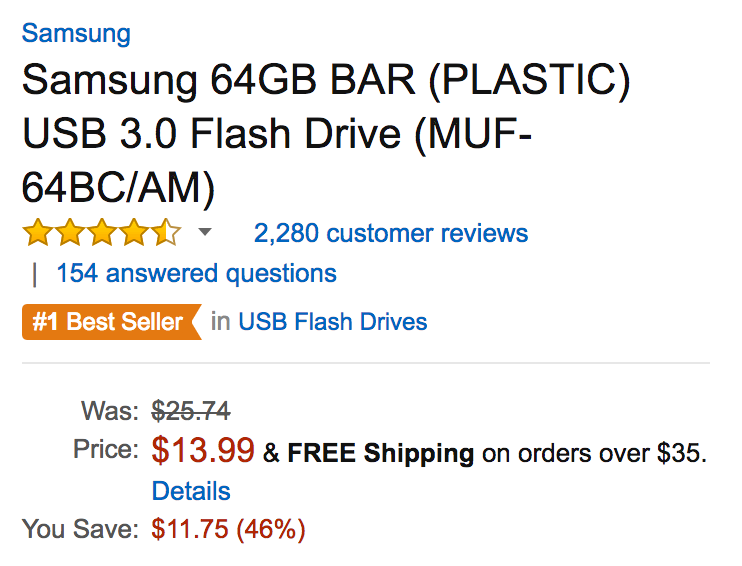 Amazon offers the Samsung BAR 64GB USB 3.0 Flash Drive for $13.99 Prime shipped. That’s good for $6 or more off the regular going rate and an Amazon all-time low. This is the #1 best-selling flash drive at Amazon, collecting a 4.5/5 star rating from over 2,200 reviewers. Features include transfer speeds up to 130MB/s, a “durable regal blue plastic body” and water/shock proof design. Ideal for portable file storage, the Samsung 64GB USB 3.0 Flash Drive Bar offers fast file transfer speeds and features a sleek, rugged design that keeps your data safe. With 64GB of storage and data transfer speeds of up to 130 MB/s, this SuperSpeed USB 3.0 flash drive lets you transfer large files in seconds. It is backward compatible with USB 2.0 ports, making it suitable for use with older devices.